The road to Kings Canyon is usually closed for about five months of the year (November to mid April) because of snow and the danger of rockfalls, but when open the drive is quite spectacular. From the giant trees at Grant Grove, Highway 180 winds through more conventional forests of pine, fir and cedar but still with a few sequoia clusters, and it is a while before the great gorge comes into view. 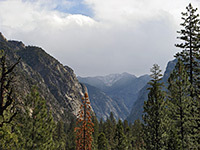 The highway runs along a high, exposed ridge for several miles, passing a number places to stop and appreciate the tree-covered vistas that stretch for a long way east, west and down to the river far below, and across the valley to higher, more rocky peaks that fade into the distance. 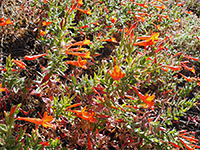 After the ridge, the route descends over 4,000 feet to the South Fork of the Kings River via many sharp bends and steep grades, soon leaving behind the pine trees and crossing the chaparral zone, then finally reaching more desert like terrain where the barren mountain slopes bear scattered cacti and yucca. This part of the river gorge is formed of particularly sheer, jagged rocks - metamorphic in composition, quite different to the smooth granite slopes found further upstream, though the scenery around the road becomes more gentle after a few miles, and eventually the pine trees return. The remaining 20 miles of the highway is at river level and so susceptible to great floods caused by melting snow that occasionally wash away parts of the pavement, such as during January 1997. Features en route (not part of the national park) include Grizzly Falls where the waters of a tributary stream drop 100 feet towards the Kings River, and Boyden Caverns which have various speleological features that can be visited on a guided tour. 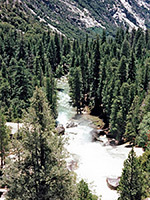 The main focus for visitor activities in the valley is at Cedar Grove, a small village on flat land next to the Kings River, 2 miles into the national park; this has four large campgrounds, a corral, ranger station and various other facilities including the main visitor center. The camps are pleasantly situated amongst the pine woodland close to the river, with plenty of room and well-shaded sites. Of the several trails that start from Cedar Grove, perhaps the best is the 3 mile route up Hotel Creek to a viewpoint on a narrow promontory, 1,500 feet above the village. 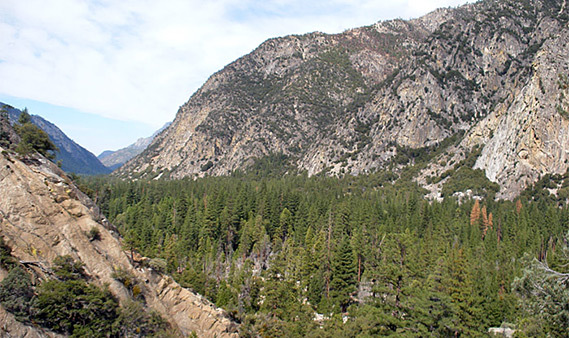 The valley floor is generally quite undeveloped, in complete contrast to Yosemite, and the road extends a further 7 miles up the canyon eastwards through empty woods and across lush meadows, always near the river. At this point the canyon has the U-shape characteristic of glacial activity, unlike the water-carved V profile of the lower gorge. Along the road are a few named roadside viewpoints although all the surrounding mountains are impressive and worth looking at. The jagged rocky cliffs often rise a mile above the valley, and beyond are occasional glimpses of the stark granite country above the timberline. One interesting place to visit is Roaring River Falls, where a noisy, fast-flowing tributary of the Kings River drops 40 feet over a narrow rocky ledge and flows down a boulder-filled slope. The falls are reached by a short foot path, which ends just in front; warning signs discourage attempts to follow the river upwards although there are good photograph opportunities above the ledge. Further east, the canyon narrows gradually, but the paved road CA 180 ends when the floor is still quite wide, perhaps to prevent damage to the flat meadows and marshy areas that line the river, such as Zumwalt Meadows which may be toured on a pleasant loop trail. 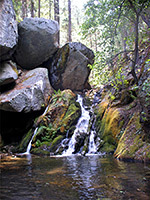 At roads end, various lengthy paths lead into the wilderness, including a popular trail to Mist Falls, one of the most spectacular waterfalls in the national park. 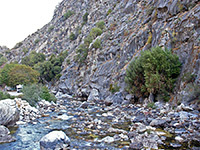 As an alternative to the main road, the unpaved, one-way Motor Nature Trail runs for three miles on the opposite (north) side of the Kings River, across land that is less forested so allows better views of the cliffs, as well as having very little traffic. The road is not suitable for RVs or other large vehicles - maximum vertical clearance is 9 feet.